Hi there everyone…it’s Cessna here. Mommy said I could use her laptop for a bit to tell you all about what her and Santa brought us. We had a very good Christmas this year and in my opinion were quite spoiled! Picture of Cessna’s presents in a pile. Picture of Canyon’s presents in a pile. Picture of Zanies Giggling Veggies – a red tomato, a green pepper and a purple eggplant all with smiling faces & limbs. As you can see we were pretty lucky dogs! Our cousin Dawsen is visiting for the weekend so we haven’t gotten a chance to play with too many of our toys, but he leaves tomorrow morning and that’s when the fun will begin. By the way, he was also pretty spoiled by Mommy, santa and Auntie. 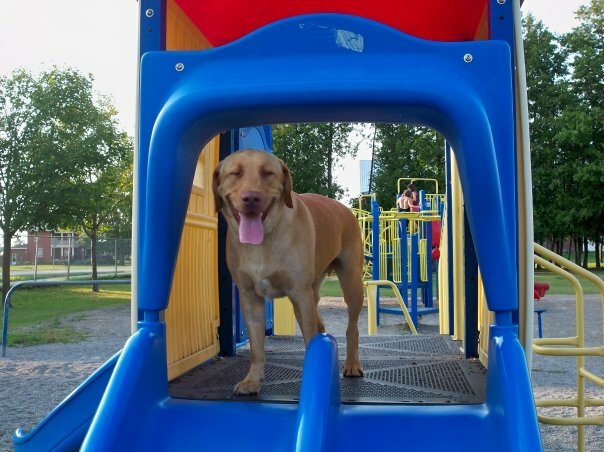 It has been about 3 weeks since Phoenix began showing signs of Idiopathic Vestibular Disease. We had our post-treatment phone consult a week ago and Dr B was quite happy with his recovery. She told us that if we notice him regressing that we should contact her and she’ll give him another homeopathic remedy. She also had us speak with one of her vet techs about a homemade food for him and he will soon begin a homeopathic regiment. Phoenix still has a slight head tilt and wears his bright orange life jacket so we can help him up and down the stairs at the front of the house, but he no longer requires assistance walking around the house or outside. He can jump onto the couch and find a comfortable spot on his own, but we still have him sleep between us at night, just in case. The past couple of weeks have been both stressful and exciting. Stressful because we’ve had to watch Phoenix’s every move and the more he recovered the more stubborn he became. But, it’s been exciting because we’ve had the opportunity to watch him progress from not being able to do much on his own to seeming healthier than he was even 6 months ago. To help him even further we bought some carpet to help give him traction when walking around the house. We’re so lucky to still have Phoenix around and will be sure to make the best of every moment we have left. 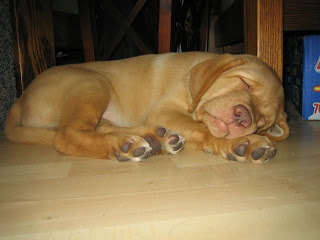 On December 23rd Aiden (our first foster puppy) will turn 3. It’s crazy to think it was almost 3 years ago since we began fostering him for Autism Dog Services. I’m so glad we were given the opportunity to raise him and am so happy he was placed with such a remarkable family. Picture of a 10 week old Carmel coloured lab. 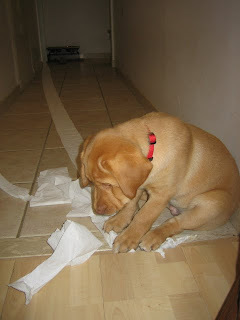 Picture of puppy Aiden looking down at little pieces of shredded toilet paper. 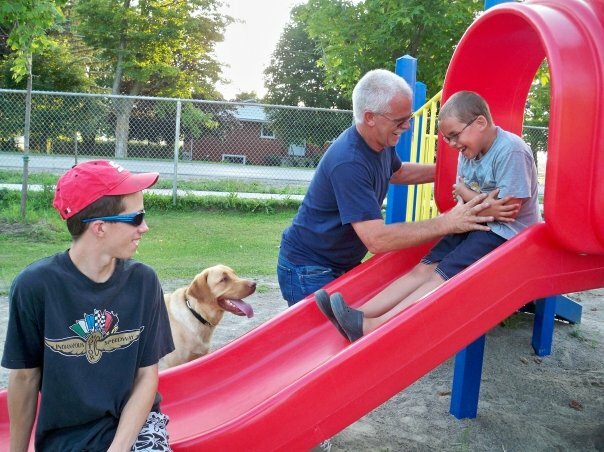 Aiden lives in Lindsay, Ontario with a middle-age couple and their two sons with autism – Kamaran and Matt. 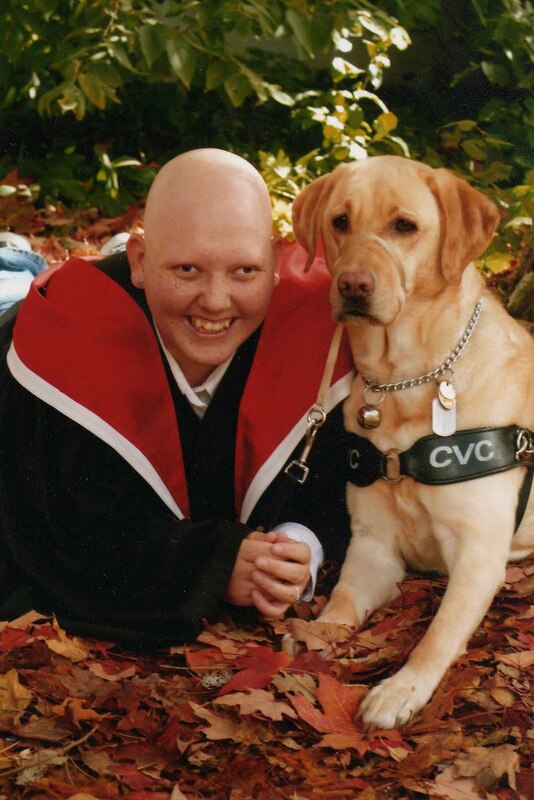 aiden is Kamaran’s autism service dog and attends school each day with him, along with other outings in the sometimes overwhelming world. We have had the chance to visit with them a couple of times since he was placed back in June of 2009 and are overjoyed with how well he is doing. Picture of Aiden watching Kamaran on the slide. Picture of Aiden at the top of a blue slide. 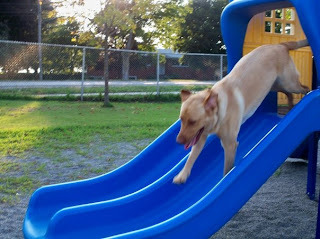 Picture of Aiden as he slides down. In September we took Canyon and Cessna to meet with them for lunch at a park in Lindsay. Aiden was beside himself with excitement as he realized it was us who pulled up in the truck beside them. As he was getting out of the van he ran directly to the back and put his paws on the tailgate to see who was with us. We had a quick McDonald’s lunch (Kam’s favourite) and played a short game of fetch. Kam thought it was great to watch the dogs wrestling and told us about his future plans of being the next Dr. Phil. It was funny to hear about what he planned to wear and how Aiden would be his side kick. His mom told us they had really begun to bond over the past few months and that Kam had actually started to call aiden when he wanted his attention. Near the end of our visit canyon decided it was a good idea to lay in a stinky mud puddle. Kamaran thought it was so funny and wanted Aiden to also join in, but he wouldn’t – I think Kam wanted Aiden to join Canyon so they wouldn’t have to return to school for the afternoon. Picture of Aiden from our visit in September. We get almost daily updates on how Aiden is doing through Kamaran’s mom and pictures on a pretty regular basis. Seeing the pictures make us miss him, but we know he’s doing what he needs to do and are so proud to have been his puppy raisers. I hope you have a wonderful birthday our little carmel friend and Look forward to seeing what the future brings for you and Kamaran.